More than a dozen protesters involved in the Nov. 9 Occupy Cal demonstrations have been presented with criminal charges, proceedings that have sparked controversy about the methods used to determine who was charged. A total of 13 individuals — several UC Berkeley students and one faculty member — are being arraigned this month after being presented with charges, which include resisting arrest, battery on an officer, remaining at the scene of a riot and obstructing a person’s free movement in a public place. Roughly 40 people were arrested on Nov. 9, so many of those arrested have not been served with charges. However, a significant portion of those who have been charged were not arrested on the day of the protest. In a March 13 letter addressed to UC Berkeley Chancellor Robert Birgeneau, the ACLU of Northern California took issue with what it called the “troubling” prosecution of individuals who were not arrested on Nov. 9 but who are prominent on campus for organizing protests. 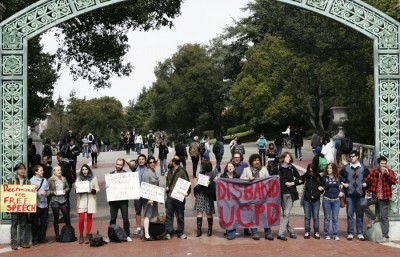 The protesters who were not arrested that day were identified using various means, including video evidence, according to UCPD. Eleven current and former UC Berkeley students were charged — Jasper Bernes, Shayne Boyle, Amanda Armstrong, Ricardo Gomez, Zakary Habash, Ramon Quintero, Joshua Anderson, Ashley Pinkerton, Justin Tombolesi, Erick Uribe and Juan Davalos — along with UC Berkeley associate professor of English Celeste Langan and alumna and BAMN organizer Yvette Felarca. 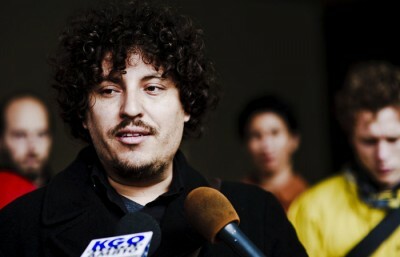 Quintero said he thought the people who were charged were chosen because of their prominence in protests. Felarca, who was charged but not arrested on Nov. 9, said she thinks the presentation of charges is “really revealing” of the intentions of UCPD and the campus administration. “The people being charged are the people police were caught beating on videotape — this is retaliation, and the police and administration are trying to cover up their wrongdoing by trying to charge those of us who were victimized,” Felarca said. But according to UCPD spokesperson Lt. Eric Tejada, determining who to charge was ultimately at the discretion of the district attorney’s office. “We make our case, and the district attorney reviews the evidence, and if they feel they have enough evidence they will move forward,” Tejada said. Tejada said police used videos and officer statements to gather evidence and identify protesters. Gomez, who is set to be arraigned Wednesday, said he found this use of video footage ironic. Still, the charging decisions led to further controversy when it was revealed last week that the Tang Center reported to UCPD the identities of protesters who went to the center seeking medical treatment. In a statement released Thursday, the Tang Center pointed out its legal obligation to do so under state law. “In cases where patients are suspected to have suffered physical injury as a result of assault or abusive conduct, California law (penal code 11160) requires additional reporting, including the name of the injured person and the person’s injuries,” the statement reads. Tejada denied any connection between the Tang Center records and UCPD’s evidence gathering process.